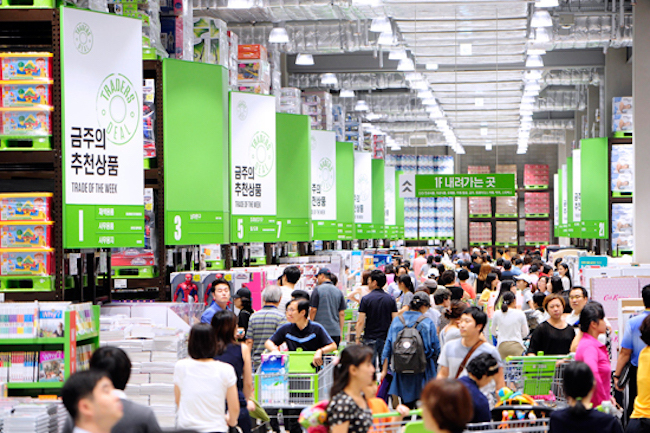 The composite consumer sentiment index (CCSI) for this month stood at a 14-month low of 101, down 4.5 points from the previous month, according to the survey by the Bank of Korea (BOK). It is the steepest on-month decline since the index lost 6.4 points in November 2016, when the country was in the midst of the impeachment of former President Park Geun-hye over a political meddling scandal. But the number has remained above the long-term average of 100 since April last year, when it snapped a five-month streak of pessimism. A reading above 100 means optimists outnumber pessimists. The BOK said its index measuring people's sentiment regarding current economic conditions fell seven points to 77 in July, while the public's assessment of overall economic conditions for the next six months slid to 87 from 96. The central bank said recent sluggish economic data, including poor employment statistics, dampened people's confidence here, along with worries of a full-blown trade war between the world's two largest economies. The number of new jobs created stood at around 100,000 for the third straight month in June, marking one of the lowest figures tallied in a decade since the 2008 global financial crisis. Exports, South Korea's key economic driver, retreated 0.1 percent on-year in June -- the second negative monthly change in 20 months. Against this backdrop, both the South Korean government and the central bank revised down their earlier growth forecast to 2.9 percent from 3.0 percent for 2018.